For those customers that use Strand Lighting CD80AE dimmer racks: the original OEM power supplies are no longer available and all repairs must now be done in house as a simple repair now entails sheet metal work and the installation of multi-pin crimped connectors. Be aware that replacement daughter memory boards for Strand Lighting CD80SV processors are no longer available and may hinder repair of badly damaged units. The MOSFET that powers the DC-DC converter in the CD80SV power supply is obsolete and no longer available - now is the time to move to a retrofit solution. EDI Mk VII processor repairs have been discontinued due to obsolescence of many ICs. A retrofit solution is now available. The large 5V regulator used on Strand CD80 digital pack controllers is now obsolete. A retrofit solution is now available. Emlight Design has been providing quality dimmer and control service since our spin off from Lytemare in 1999, It is Emlight’s mission to provide the best service possible in an honest and straight forward manner. 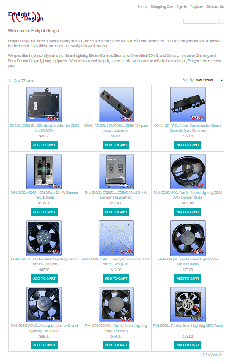 We specialize in Johnson Systems Inc., Strand Lighting, Electro Controls, Electronics Diversified (EDI), Strand Century, Innovative Dimming, and Doug Fleenor Design lighting equipment. Whether you need a repair, a new retrofit, spare parts or technical consultation, Emlight is here to serve you. 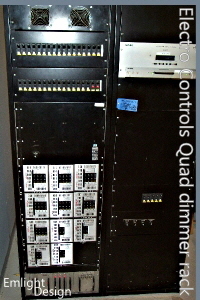 A dimmer rack in need of a dimmer retrofit.